Silverlon dressings provide a sustained release of silver ions within the dressing, capable of eradicating MRSA in four hours and Pseudomonas in less than two. *Citation: 510(k) K122817, page 174 of 379. Data on file. When activated by moisture, silver ions are released in the dressing, providing the immediate antimicrobial activity as well as a protective barrier against a broad spectrum of pathogens including MRSA and Pseudomonas. And, the antimicrobial activity remains effective for up to seven days. This high concentration of pure silver provides a large reservoir of deliverable silver ions within the dressing, when activated and applied to the wound. For complete Instructions for Use, please visit Instructions for Use. 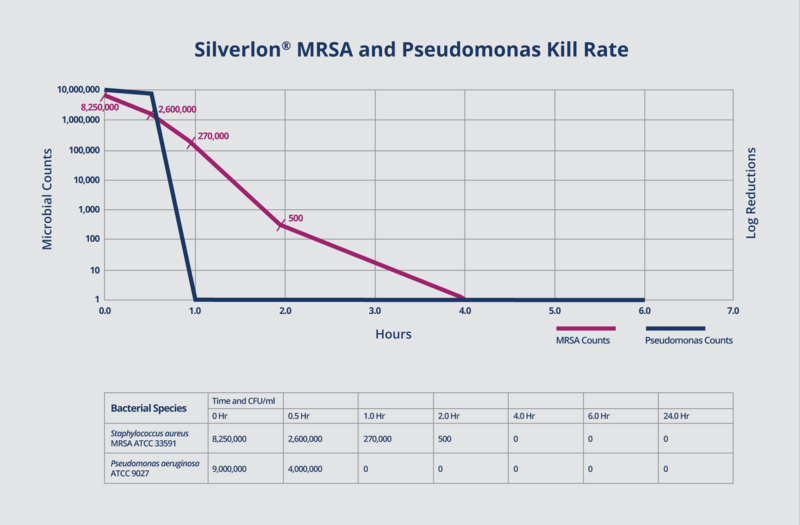 Silverlon has an antimicrobial effect within two hours against MRSA with eradication in four hours.